Pope Francis has removed Fernando Karadima from the priesthood, seven years after the Vatican found that Karadima had sexually abused minors in Chile. The move is effective immediately. It was announced in a brief communique from the Vatican's press office, stating that Francis had signed the decree removing Karadima from the priesthood on Thursday and that Karadima was informed of the pope's decision on Friday. 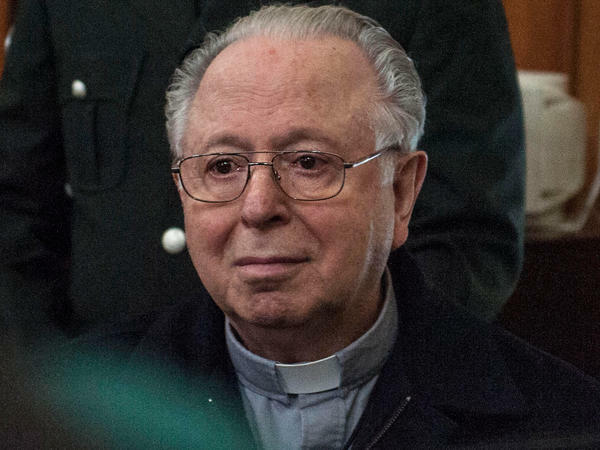 Karadima, 88, had already been forced to retire from ministerial duties, after a Vatican tribunal found him guilty in 2011 of sexually abusing dozens of minors, in a scandal that erupted in 2010. "Karadima escaped civilian justice but was sentenced by the church to a lifetime of penance and prayer," NPR's Sylvia Poggioli tells our Newscast unit. "That sanction has long been criticized by victims as too lenient. For a priest, being defrocked is the stiffest penalty short of excommunication from the Catholic Church." In June, the pope accepted the resignation of three Chilean bishops over the church's handling of the sexual abuse cases — including Bishop Juan Barros of Osorno, who was a protégé of Karadima. Barros has been accused of covering up Karadima's abuse in cases that date back to the 1980s. Both of them have denied the allegations against them. Francis has faced intense criticism over his handling of the abuse scandal in Chile, particularly after he appointed Barros as a bishop in 2015 — a move that enraged thousands of Catholics. Abuse victims in Chile were also angered in January when the pope dismissed allegations against Barros as "calumny," saying he had never seen proof against the bishop. The outrage that followed seemed to persuade Francis to send a new investigative team to Chile — and soon afterward, he admitted he had made mistakes and had been given incomplete information. The process of defrocking a priest is so unique that the Vatican has used a number of phrases to describe it. An initial bulletin said that Francis had in effect "resigned" Karadima from the clerical ranks. The Vatican's news service later put out a report saying the pope had "laicized" the priest – implying he has now been returned to the status of a layperson.